When star sorority girl Elle Woods gets dumped by a boyfriend who is looking for a more serious girl, the UCLA Fashion Merchandising major puts down her credit cards and hits the books to go where no Delta Nu has ever gone before: Harvard Law! Along the way, Elle proves that being true to yourself never goes out of style. A hit on Broadway, “Legally Blonde” is a feel-good musical that will have you on your feet cheering for Elle and her friends. From the opening notes of “Omigod You Guys” to the finale, “Find My Way,” you’ll understand why this perky charmer with a penchant for pink has delighted theatre audiences since the show opened on Broadway in 2007. 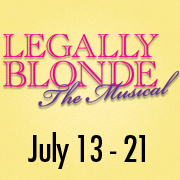 On stage July 13 – 21, at the beautiful Halton Theater on the CPCC Central Campus, “Legally Blonde” is the perfect summer show. Great tickets are just $18 and $22. Best of all, a special BOGO (buy-one ticket, get-one free) offer for the Wednesday, July 18, 7:30 p.m. performance makes this the perfect and MOST AFFORDABLE summer show! This is the first time CPCC Summer Theatre has offered a BOGO ticket to the public, so don’t miss out. Call the box office at 704.330.6534 and ask for the Wednesday BOGO offer for “Legally Blonde.” Tickets to other performances of “Legally Blonde” are also available online at tix.cpcc.edu. To take advantage of this BOGO offer, you must call the box office. Grab a friend, family member, sorority sister, manicurist, UPS man, or anyone else and come enjoy a great show for as little as $9 a ticket. Did we mention that parking is free?